FILE - U.S. Marines are seen boarding a military transport plane. President Barack Obama is sending U.S. military personnel to Cameroon to conduct airborne surveillance of Boko Haram militants. The troops were invited by Cameroon’s government as part of a larger international effort to stop the spread of violent extremists in West Africa, a U.S. defense official said. The need for international action has become “more urgent as Boko Haram and other organizations ramped up their violent activities,” the official added. Boko Haram has been active in northern Cameroon, which is across the border from its home base of northeastern Nigeria. The militant group has killed hundreds of civilians in Cameroon, in addition to at least 10,000 in Nigeria over the past few years. Obama announced the deployment in a letter sent Wednesday to the heads of the U.S. Senate and House of Representatives. He said about 90 U.S. military personnel began deploying to Cameroon Monday, with the total U.S. force expected to number about 300. 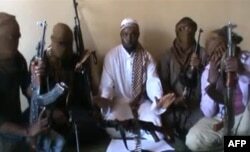 FILE - Boko Haram leader Abubakar Shekau, center, is flanked by militants. Nigeria's military said it had killed the second-in-command of Islamist group Boko Haram while repelling an insurgent attack earlier in April 2012. “The deployed personnel will support Intelligence, Surveillance and Reconnaissance (ISR) flights being conducted in the area,” said Defense Department spokesperson Lt. Col. Michelle Baldanza. In addition to remotely piloting the surveillance flights of unarmed MQ-1 predator drones, the troops will focus on enabling operations, border security and response force capability, according to a defense official. The troops will be based in Cameroon’s north at a contingency location near a civilian airport, a separate U.S. official told VOA on the condition of anonymity. FILE - Cameroon's army soldiers deploy against the Nigerian Islamist group Boko Haram in Dabanga, northern Cameroon, June 17, 2014. White House Press Secretary Josh Earnest said the troops will act in coordination with Cameroon's government and that the troops will be armed for their own security, not for a combat role. 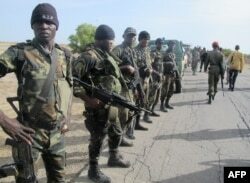 Cameroon is one of the countries taking part in a joint regional task force to fight the militant group, which seeks to create a strict Islamic state in northern Nigeria. Other countries in the task force are Chad, Niger and Benin. VOA White House correspondent Aru Pande and Africa editor Dan Joseph contributed to this report.